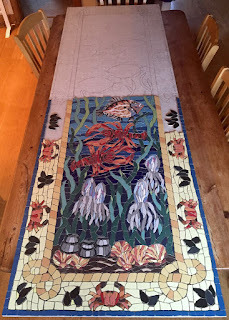 Thanks for all your support for my latest commission of a sea-themed mosaic floor. I am so enjoying making it! The next panel is now well on its way. 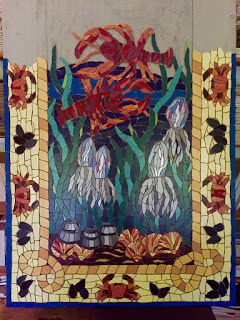 The two panels have to join seamlessly when they are installed in the house, so the tiles have to match effortlessly. 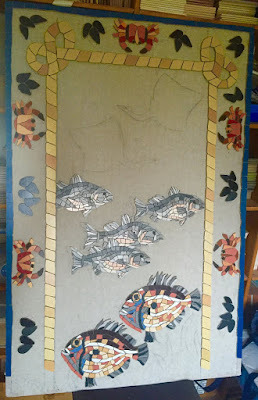 I will cut them them when the second panel is nearly finished when I can have the two panels next to each other. 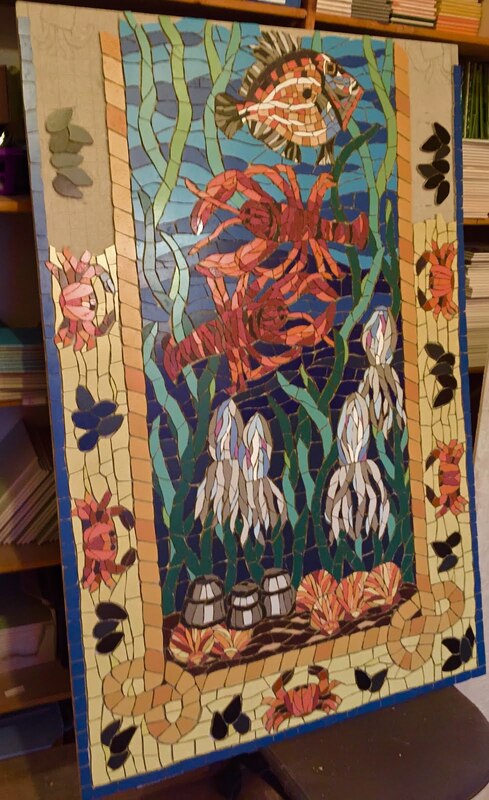 On the border, there is half a crab on each panel, so I have to get that absolutely right! After, I had drawn a rough design of the fish and weeds on the second panel, the first part was relatively straight forward, as I made two more John Dorys. I had all the colours and shapes already out on my work table and in my mind. Then came the sea bass. 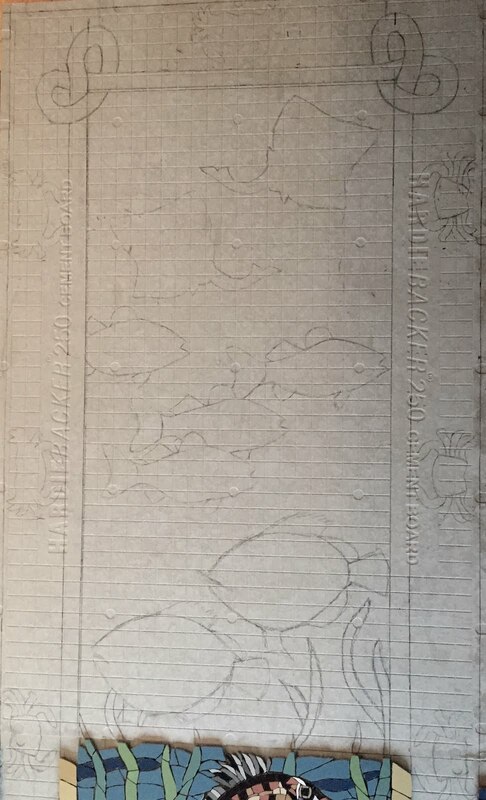 I wanted a little shoal of them, looking as if they were swimming across the panel. 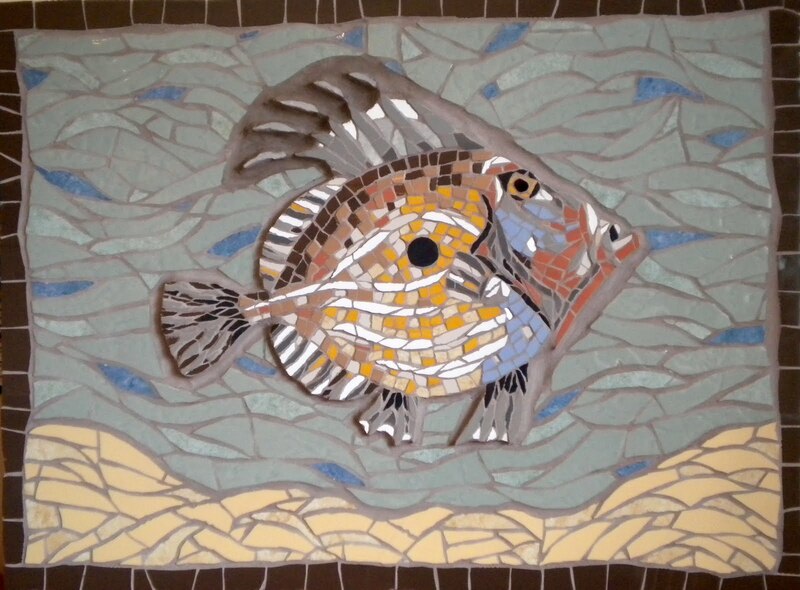 I loved the pinks and greys of the scales so really picked those out, contrasting with the John Dory colours. 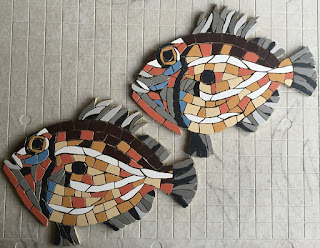 Now these sea bass were tricky - getting the line, shape and expression just right. I wanted them all to be different and have their own character - I think I got there in the end! 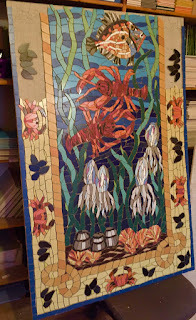 I then finished off the whole crabs and mussels around the border, along with the rope, and things are really taking shape! 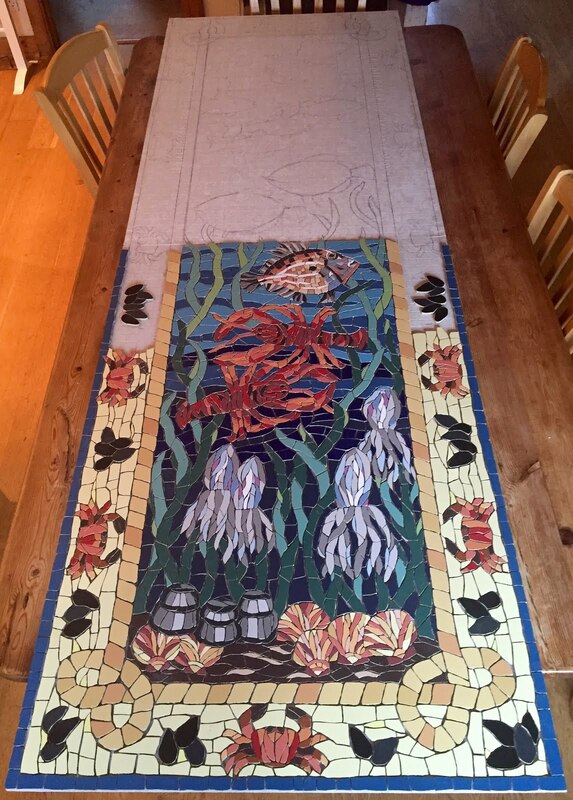 My mosaic floor panels are coming on nicely - the first is practically finished! 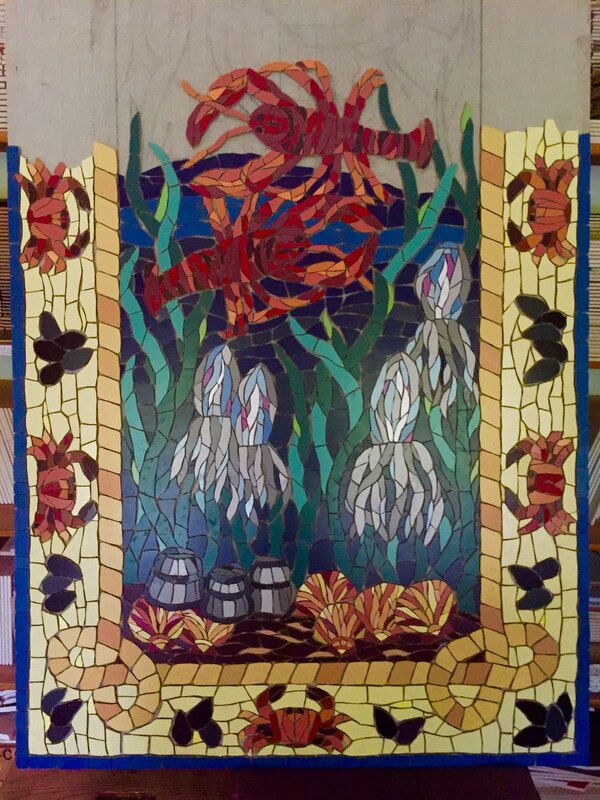 I have enjoyed making it so much - you have probably gathered that - and now that I embark on the the second panel, I don't want it to end! There is a deadline for this project though... so onwards and upwards! In my last post, we had lobster pots, scallops, squid and lobsters. Next, I had a John Dory to mosaic. 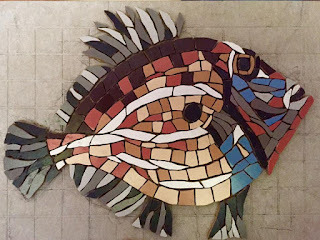 Now I have made a John Dory before, so I had a good starting point - see below. 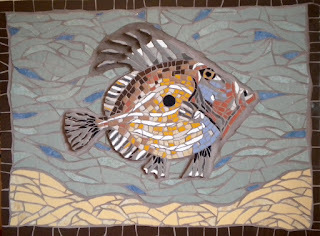 As I am using the porcelain tiles, I didn't quite have this range of colours available to me, but enjoyed using this slightly limited palette to make him - really pleased with the result below. I needed to continue the background of the sea and the weeds now. I have eight shades of blues to use, gradating from dark to light - approximately four for each panel. I want to mosaic them in waves of colour so they do not distract the eye from the main events. 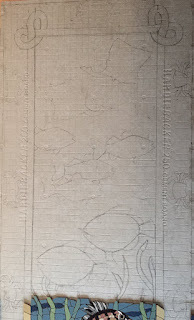 Then moving up the panel .. I am starting to get excited now as it is all taking shape. Many thanks for reading, and any sharing of my work you can do, is always greatly appreciated.